In 2007 the first crop by Romanov turned three and they clearly met our high expectations. His son Skovens Rafael became premium stallion at the Danish licensing and sold at auction as price highlight for the Danish record price of 1.2 mio dkk. Two daughters of Romanov were awarded medals at the elite mare show and the young Romera K became 2 year old champion mare. Two sons of the first German crop were approved at the Oldenburg licensing in Vechta in 2007 and nothing less that 9 sons are selected for the Danish licensing in Herning! After having dominated the young horse championships at the age of 4, 5 and 6 Romanov made his “small tour” debut in 2007 at the international show in Lingen where he came second in St. Georges and fourth in Intermediaire I. His debut was followed up by winning the Intermediaire I at the World Cup qualifier in Odense. 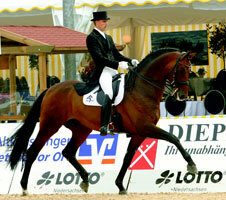 Romanov was runner-up champion in Oldenburg 2002. The combination of elite mare Rumirell with the main premium and champion stallion Rohdiamant has proven to be a golden cross resulting in nothing less than five approved full brothers; main premium stallion Rubin Royal, Romanov, Rumicello, Rubino Vincente and Rubin Action. The dam lineage of Rudilore has produced a vast number of highly successful sport horses and stallions like Conterno Grande and Coleur Rubin, both premium stallions and runner-ups at the federal championships, as well as D-Day, Don Chico, Trantris and Gio Granno. Foundation mare Rudilore II competed internationally in eventing. 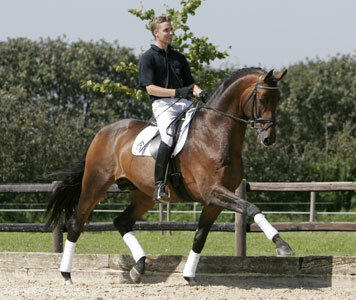 Dam sire Grundstein II is known for passing on sport talents for dressage as well as jumping and his offspring has competed at both the WEG and the Olympics. Akzent II is known as a great dam sire of many stallions and marking his offspring with superb type and ridability. Romanov is approved in Denmark, Oldenburg, Hanover, Westphalia and Rhineland.